By Alexis Leon and Mathews Leon, Leon Vikas, 2012. 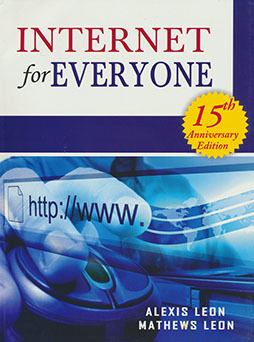 Internet for Everyone (15th Anniversary Edition) introduces the basics of the Internet and World Wide Web (WWW). You will learn what Internet and WWW are and how to use them from your computer. The fundamentals of Internet and WWW, the important ideas and concepts like Internet addressing, communication protocols, web browsing, etc., are introduced in a simple and easy-to-understand fashion. This book fully explores the tools and technologies that are necessary to get productive on the Internet and WWW. Topics like ‘How to surf the Web more effectively?’, ‘How to conduct a search on the Internet?’, ‘How to create your presence on the Web?’, etc., are given a thorough treatment. You will soon find that the Internet does not stand still; but the topics covered in this book will give everything you need to get started and gain some degree of comfort with Internet and you can take off from there. The earlier editions had covered the basics to make the book attractive to the newbies and novices. This edition retains the same simple approach, but covers more advanced topics too. Internet and WWW have grown by leaps and bounds. It has become an integral part of our lives. Now we need to be more careful and cautious while using the Internet as the number of Internet criminals and cyber crimes has gone up. Internet is no longer a safe place and the penalty of not learning how to protect your privacy and anonymity can be catastrophic. This book explains security, safety, and anonymity in a comprehensive manner. Today, Internet and WWW have opened a lot of opportunities for you to make money. There are many ways that you can make money if you are willing to work hard. This book explains how to make money on the Internet. The earlier editions introduced the readers to the importance of having a Web presence. This edition goes beyond that and covers the technologies available for creating a Web presence. It also contains a case study, which gives step-by-step instructions on creating a website without spending any money; all you need is an Internet connection, some free time and willingness to learn. The book deals with the new trends and technologies like blogging, social networking, instant messaging, electronic publishing, etc. It introduces the reader to these technologies and explains how they work and how to make best use of them. In most cases, the book provides a list of resources which are freely available and could be used immediately. The book has been made more interesting by including trivia and facts (Did you know? ), resources (Useful Websites and Further Reading) and also tasks that you can perform (Web Workout). There are a lot of illustrations and screenshots to make the concepts clearer and easier to understand.